What is violent extremism? The Department of Homeland Security website defines it as threats coming from a range of groups and individuals, including domestic terrorists and homegrown violent extremists in the United States, as well as international terrorist groups like al-Queda and ISIL. It also states that individuals and small groups could become radical and commit violence or travel overseas to become foreign fighters. What the Department of Homeland Security doesn’t state is that Islam or the Muslim community is directly related to violent extremism. It’s a common misconception and a stigma that some people believe is true, and that’s the conversation Cal Poly students started on Nov. 16. DISCUSSION: Cal Poly students created a campaign that talks about the impact of violent extremism in the Muslim community. 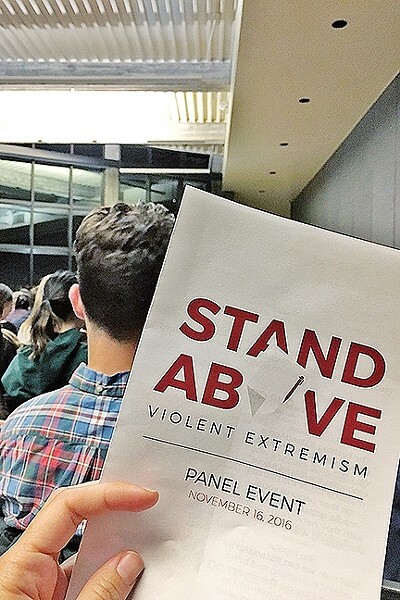 Students packed a conference room to listen to the Stand Above campaign with a panel of professors as well as members of the Cal Poly Muslim Students Association. The discussion started by defining the atmosphere that San Luis Obispo creates for the Muslim community. Members of the student association said that they have noticed a change in how their peers interact with them, that many students made the effort to make eye contact or smile at them. These students are seeing that their peers are aware of the adversity that the Muslim community is facing nationwide. Hisham Assaal, professor of computer science at Cal Poly, said the only American community he’s had experience with is San Luis Obispo and it’s been overall very positive and open. Assaal said the notion of violent extremism has generated interest in the Muslim community. As an educator, Assaal said knowledge about the difference between Islam and what drives individuals to violent extremism is important. The concept of violent extremism never really occurred to many on the panel until Sept. 11, 2001. Salar Malik, former president of the Muslim Student Association, said that growing up in the Bay Area, he never realized he was different from his friends and his community until the attack on the World Trade Center occurred. He had never heard of fellow Muslims practicing violence. The Stand Above project came about from EdVenture Partners, an organization that connects university students with a business client in order to do marketing and outreach for a campaign to the millennial audience. This year, the project was called Peer to Peer: Challenging Extremism, and the clients are the Department of Homeland Security and Facebook. Joan Mullikin, a marketing professor at Cal Poly, said that this was a very unusual topic but “they have taken the ball and ran with it.” Mullikin said the project is a good exercise for the students as they are faced with scenarios that they could encounter in a workplace. Given the current political situation, she said this was a great project for her students and the community to learn about the discrimination that violent extremism is causing. “Muslims are a religion of peace, and extremists and terrorists are something unusual—not part of the Muslim religion,” Mullikin said. Something that she has learned during the process of this project is that discrimination is at the root of the problem. “If discrimination could be taken care of then people wouldn’t feel isolated and they wouldn’t feel tempted to go to radicalism,” she said. With the collaboration of EdVenture Partners and the project the students have created, Mullikin has observed that this generation has many outlets to contact and positively influence one another. The students will finish their campaign, collect their data, create a report, and could end up being chosen to go to Washington, D.C., to present their findings to the Department of Homeland Security and Facebook. Staff Writer Karen Garcia wrote this week’s Strokes and Plugs. Send story ideas to strokes@newtimesslo.com.